Peel and roughly dice kohlrabi. Peel and finely dice onion. Add diced onion and kohlrabi to a microwave-safe baking dish. Season with salt and add olive oil. Cook at 600W for 5 min., using microwave function. Meanwhile, quarter cucumber lengthwise and remove seedy cores. Slice, then cut in bite-sized pieces and set aside. Add maple syrup, mustard, white balsamic vinegar, vegetable broth, and bay leaf to a bowl. Season with salt. Remove baking dish from the oven and add cucumber. Pour over the sauce and distribute butter in pieces on top. In the oven with microwave function, bake for 10 min. at 150°C/300°F, 360W. Meanwhile, cut salmon in desired pieces and season with salt. Pluck dill from stalks and finely chop. 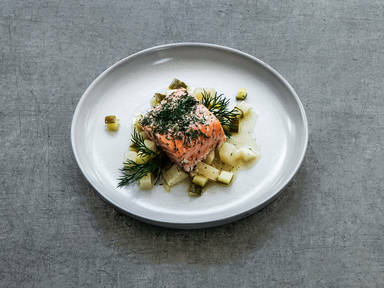 Remove baking dish from the oven, add salmon on top and sprinkle with dill. Bake at 150°C/300°F, 180W for 5 min. more. Garnish with dill. Enjoy with rice, if desired!